The Saab 37 Viggen ("Thunderbolt", also "Tufted duck") is a Swedish single-seat, single-engine, short-medium range combat aircraft. Development work on the type was initiated at Saab in 1952 and, following the selection of a radical delta wing configuration, the resulting aircraft performed its first flight on 8 February 1967 and entered service in 21 June 1971. 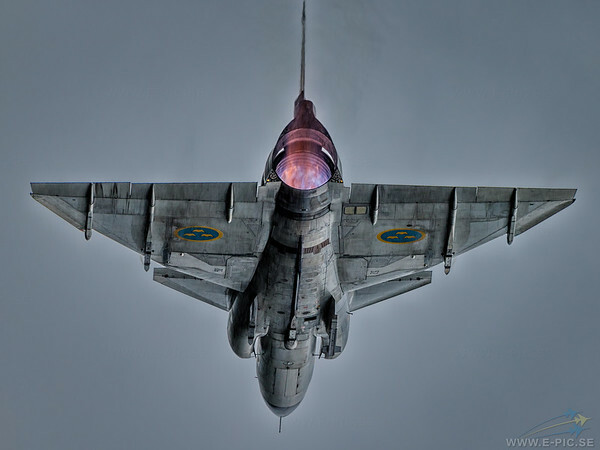 The Viggen holds the distinction of being the first canard design to be produced in quantity. During the later half of the 1970s and into the 1980s, the introduction of various variants of the Viggen proceeded; these included the SK 37, a two-seat operational-conversion trainer, introduced in 1972, the SF 37, an overland reconnaissance model, introduced in 1977, and the SH 37, a maritime reconnaissance version, introduced in 1975. By September 1980s, the JA 37 fighter-interceptor model of the Viggen was introduced. The Viggen went on to become Sweden's primary air defense platform for many years. When operated from austere bases and improvised landing strips such as public roads, an intended function of the type, a single Viggen could be maintained by a team of five conscripts under the supervision of a single chief mechanic. During such operations, a standard turnaround, including refueling and rearming, took less than ten minutes to perform; while an engine replacement took four hours. By the mid-1980s, Swedish Viggen fighter pilots, using the predictable patterns of Lockheed SR-71 Blackbird routine flights over the Baltic Sea, had managed to achieve missile lock-on with radar on the SR-71 on numerous occasions. Despite heavy jamming from the SR-71, target illumination was maintained by feeding target location from ground-based radars to the fire-control computer in the Viggen. The Viggen is the only aircraft to get an acknowledged radar lock on the SR-71. By 1994, the replacement of the Viggen by the later and more advanced Saab JAS 39 Gripen was in progress, the type being progressively phased out as greater numbers of Gripen aircraft were delivered. In November 2005, the last front line Viggen was formally retired by the Swedish Air Force. The last Viggen flights took place in June 2007.